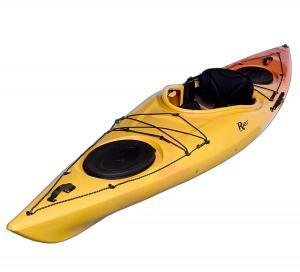 6 Best Sea Kayaks in 2019 – Top Rated Models Reviewed! Imagine the sea breeze in your hair as you paddle by coastal landscapes. 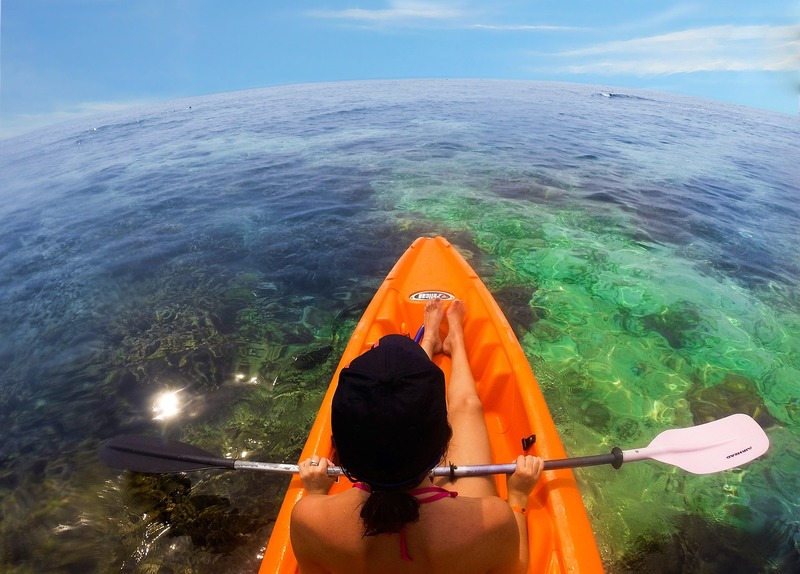 Sea kayaking is a fantastic adventure that’s even better when you find the best sea kayak for you. Kayaks for the sea need to be durable and aerodynamic, with ample storage space for longer trips. Most importantly, a sea kayak should track well in the water. Here’s a look at some of the top sea kayaks on the market. Once you’ve covered all the basics, it’s best to choose yours based on your individual needs and recreational preferences. If you’re looking for a lightweight kayak that’s easy to carry and budget-friendly, the Dagger Zydeco 9.0 is a great option. It’s perfect for flat or slow-moving water on coastal paddles. The short length means sharp twists and turns for fun exploring beaches and inlets. Despite its short length, the cockpit of this kayak is quite roomy. This allows for a comfortable ride for kayakers of a wide range of sizes. Speaking of comfort, you’ll also find a cup holder, adjustable foot braces and thigh pads. Additionally, there’s the CFS-R seating system with multi-adjust options. For the safety of your equipment, the Zydeco offers bungee deck rigging and a paddle park. 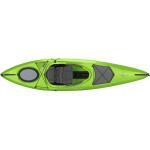 With a polyethylene outer layer, this kayak is also a durable option. If you need something that can keep up an active day out on the water, check out the Tsunami 125 from Wilderness Systems. It’s designed for day touring with great maneuverability. This sea kayak can take anything you throw at it, not to mention that it’s fantastic in terms of slicing, twisting, and turning with the greatest of ease. The seating system features the Phase 3 AirPro Tour seat to keep you comfortable. Once you add the adjustable thigh pads and foot brace system, you’ll enjoy your day on the sea without a care in the world. Perhaps best of all, you’ll also find a spacious cockpit to suit larger paddlers. There’s a water bottle holder inside the cockpit, for easy refreshment. With a 300-pound weight capacity, it’s easy to fit your gear on this kayak. Two storage hatches keep your supplies safe and removable mesh pockets on deck hold the essentials. Speed and stability in ocean waves is ensured, via a hull with a multi-chine V-shaped profile. The Edge 13 LV from Riot Kayaks features a slender bow and slim deck build that is perfect for day touring trips. This kayak has an extremely low profile while also being quite lengthy. 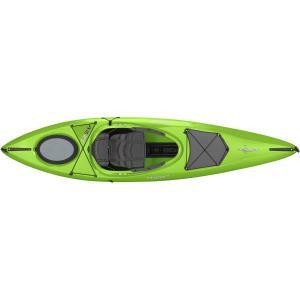 Advanced comfortable seating means paddling in this kayak is a breeze all day. The rudder system keeps you tracking across the water with precision, for a smooth ride. Do you love fishing while you kayak? An added bonus of the Edge is a flush mount rod holder, so you can indulge in your sport. For storage, there are two sealed compartments at the front and back, with dual density lids. There’s also hand shock cord storage at the foredeck. With both primary and secondary stability, it’s pretty hard to tip this yak. Therefore, it may be the best sea kayak for you, if you’re a beginner or often paddle with children. When you think about sea kayaks, the word “inflatable” probably doesn’t come to mind. However, the RazorLite 393rl from Sea Eagle Boats changes all that. The RazorLite inflatable kayak is the first ever to be drop-stitched over a tapered, hard-nosed bow and stern. What does this mean for you? Well, because of the way this kayak has been designed, it’s able to cut through waves a lot cleaner and sharper than most other kayaks on the market. As a matter of fact, because of its build, you can get up 6 mph paddling speeds. In terms of onboard features, there are two open and close drain valves, a large, removable, rear skeg as well as front and rear spray skirts with carry handles. To really make this thing move, we recommend picking up a wind paddle, which coincidently rigs up fairly easily to the RazorLite 393rl. Simply put, the Axis 10.5 from Dagger is a multi-water beast. It shows amazing versatility when getting out on lakes, reservoirs, intercostal waterways and even smaller ponds. Tracking with this kayak’s height-adjustable drop skeg is amazing and will keep you on point in some of the roughest waters out on the ocean. The perfectly defined chines take your maneuverability from a 0 to a 10, real quick. Spray skirts for the Axis can be fitted with thigh braces if you need them for rougher, choppier waters that will have you bumping around. This kayak is often defined as an “oldie but a goodie”. It’s won a couple of awards and is generally spoken of in good favor. It’s best for the eclectic paddler who may want to go from a nice relaxing ride to more challenging trips in rough ocean waves. Like they say, leave the best for last. This one may just be the best sea kayak on this list, especially if enjoy kayaking with family and friends. 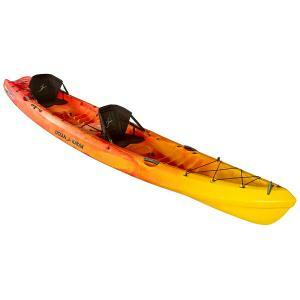 The Ocean Kayak Zest 2 is a tandem, sit-on-top sea and touring kayak. This means you can take it out in the wide open sea and you can bring along a friend for the ride if you like. In this cockpit, you can fit two adults, and even a small child or a pet. Along with providing heaps of room, the Zest 2 offers supreme comfort. There are various molded-in foot braces with plenty of space around them for your stability. Comfort Plus seats help to soften bumpy rides out on the sea. In terms of storage, you’ll find the Zest 2 is well prepared with a huge tank well and bungees to secure your items. In addition to this main storage space, there’s also some bow deck space with bungee cords. Side carry handles make transporting this kayak a little bit easier and molded-in cup holders hold your drinks. There’s also a skid plate and two paddle keepers. If you want to take your child, significant other, or a friend out on the water with you, along with some gear, this is the sea kayak we recommend. There are many different brands of kayaks out there on the market, but not all of them are created equally. 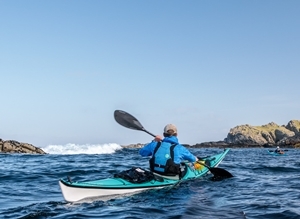 When choosing the best sea kayak for you, it comes down to more than just brand and style it. Here are five considerations to keep in mind. Mother nature can be harsh and transient. When waters get rough or nasty weather picks up, you want to make sure you’re prepared. Most kayaks nowadays are made of a polyethylene material but you’ll also find good-quality inflatable kayaks work just as well. Usually, people have a preference when it comes to materials, but just make sure that whatever kayak you decide to go with doesn’t feel brittle or flimsy to the touch. When purchasing a kayak you really do get the materials that you pay for, so be mindful of this. You don’t want to choose a kayak that’s too heavy nor too light; it needs to be just right. There are few reasons for this, the first being that if you’re a smaller kayaker, then you need a yak that you can transport easily, without much strain or hassle. Secondly, you don’t want it to be too light. If your kayak is too light it will affect the ride that you have in imperfect weather conditions. The need for storage space and decent weight capacity on a kayak differs between kayakers. What do you want to do while kayaking? If you love day-long paddles, it’s important to ensure there’s plenty of storage space for snacks, water and anything else you require. For fishing, the best sea kayak for you might need a higher weight capacity, if you intend to catch your dinner! Probably one of the most important things to look for in your next kayak, is its shape. It needs to be aerodynamic and able to easily cut through the water. The shape overall also determines what kind of rides you’re going to get out of it. For example, if the bottom has a lot of imperfections or has any small warped areas, you’ll experience an inferior ride. Choosing a good sea kayak doesn’t have to be a tough decision, with some careful consideration. For experienced paddlers who want to go on long trips, we recommend something like the Wilderness Systems Tsunami. 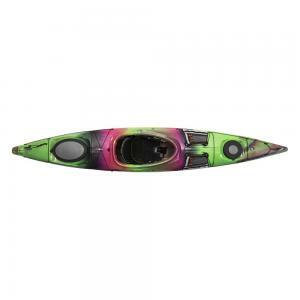 For beginners however, we recommend starting out with something like the Dagger Zydeco or the Riot Kayaks Edge 13 LV. As always, we hope you’ve enjoyed our comparison of the top 6 sea kayaks on the market. If you have any questions, comments or recommendations to add, please let us know in the comments!